After his recent debut as 1/2 of the new collaborative duo YOUDONTSAY! 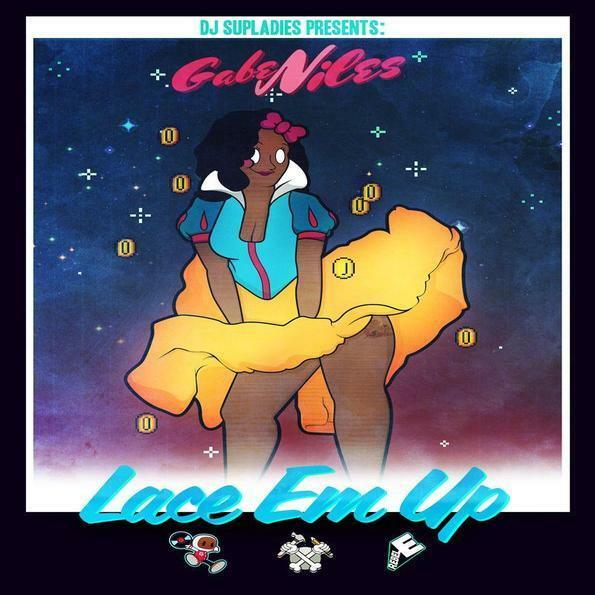 last month and the release of YDS's rework of "Get Free" (a remix which has drawn praise and a major co-sign from Diplo & Switch while gaining plays and downloads from 109 different countries in a week), DJ/producer Gabe Niles returns with his latest full-length solo project, Lace Em Up. Traces of Niles' French house/disco and big band influence can be heard on the opening half of the 18-track compilation, while the latter half of Lace Em Up is largely characterized by the Virginia natives' more regional sound which features quirky synths and drum pattern and keeps with the identifiable sound of Virginia house music. Some standout tracks on the dance instrumental compilation are "CANDY SHOP", " LOVE ON THE FLOOR", which features a prominent sample of DeBarge's hit "All This Love", and the final track "DOOBiE FOOL" which employs of all things a flip of The Doobie Brothers' hit "What A Fool Believes". Per Gabe Niles' instructions, "dance, drive, zumba, cook, climb, crunk, hump," or whatever else floats your boat while listening to his latest project. Stream the aforementioned three tracks below and follow the direct download link to grab a free digital copy of Lace Em Up, which is also streamable directly from Gabe's website and Soundcloud page.